Hello, everyone. I thought I’d continue with the reviews on SAP variations of vitamin C serums. Today I’ll be focusing on one I repurchased 3 times in the past! The #1 amazon best seller — InstaNatural’s Vitamin C Serum 20%, a.k.a the Age Defying & Skin Clearing Serum. Given I used it for several months, I feel I’m qualified to answer what’s good about it and what’s not. There are some things I adorable about this serum, and other aspects I find questionable. Let’s get into them! This is probably the most appealing part about the InstaNatural Vitamin C Serum 20%. At a quick firsthand glance it sounds spectacular — it has 20% Vitamin C (SAP), 3.5% Niacinamide, 2.5% Retinol, and 2% Salicylic Acid. Like one reviewer put it on Amazon, “it saves you time and money because all these ingredients are packed into one product.” Sounds pretty logical, right? While I see where they’re coming from, it’s not entirely true because of the serum’s pH. More about that in a bit…. Deionized Water, Organic Aloe, Vitamin C (Sodium Ascorbyl Phosphate), Methylsulfonylmethane (MSM), Vegan Hyaluronic Acid, Vitamin B3 (Niacinamide), Retinol, Olive Oil Squalene, Capryloyl Salicylic Acid, Rosehip Seed Oil, Carbomer, (2s)-2-Amino-5-guanidinopentanoic Acid, Pink Grapefruit Essential Oil, Tea Tree Essential Oil, Lavender Essential Oil, Ylang Ylang Essential Oil, Organic Gotu Kola (Centella Asiatica), Wildcrafted Horsetail (Equisetum Arvense), Wildcrafted Dandelion (Taraxacum Officinale), Wild Geranium (Wildcrafted Geranium Maculatum), Phenoxyethanol, Ethyl Hexyl Glycerin. The cornerstone ingredient in InstaNatural’s Vitamin C Serum. As the name implies there’s 20% of this stuff in the entire product, making it super potent. Sodium Ascorbyl Phosphate (SAP) is a very bioavailable form of Vitamin C, which allows your skin to absorb it easily. Unlike Ascorbic Acid, it doesn’t oxidize quickly making it a preferable ingredient to incorporate in skincare products. Generally when people look for vitamin C serums they go for the ascorbic acid variation. Why? Because it’s the most potent form of vitamin C, and its benefits are plentiful and well documented. It brightens skin ton, treats hyperpigmentation, increases collagen production etc. With that said, it has a terribly low shelf life when not properly formulated (which is often). And it requires an inherently low pH to function, which could cause irritation for those with more sensitive skin types. In studies, the vehicle is used for comparative purposes and is composed of inert substances with no pharmacological activity. So the fact that SAP produces the amount of irritation the vehicle does is astonishing. Particularly because SAP comes with a load of benefits! It fights acne better than 5% benzoyl peroxide monotherapy, and can be used as a natural alternative to antibiotics. (4, 5) It brightens skin tone and treats hyperpigmentation. And it provides photoprotective properties — that is, it helps protect the skin from the adverse effects of sun exposure like aging, sunburn, free radical formation etc. To this day, SAP is considered one of the most gentle and effective skincare actives on the market. These are just a few reasons SAP is total badass. If you’d like to read my full blog post about it click here. Another all star ingredient with a ton of benefits. It’s gentle and non-irritating. Lightens skin, and treats hyperpigmentation. (6, 7, 8) Increases hydration and improves barrier function. (9, 10, 11, 12) Has some acne-fighting properties, and a suitable alternative to antibiotics. (13, 14, 15) It increases collagen production, and has well-documented anti-wrinkle effects comparable to prescription tretinoin (Retin-A). (16, 17, 18, 19, 20, 21) In other words, it does it all! However, the placement of it in this formula is a bit questionable. There’s debate about whether Retinol is pH dependent or not. (31, 32, 32, 33) Some experts no, others say yes. I personally err on the side of caution and say it is. Under that premise, Retinol would function optimally at a pHof 5.5-6. 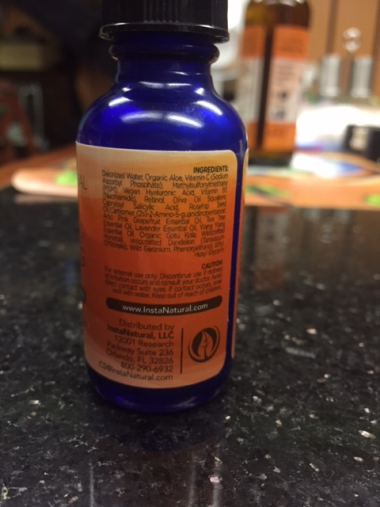 The pH of the InstaNatural Vitamin C Serum 20% is around a 7. (I tested it at home, but also emailed them to confirm.) With that said, the addition of Retinol in this product may be nothing more than marketing. An oil-soluble chemical exfoliate that unclogs pores, treats warts, acne, and hyperpigmentation. (34, 35, 36, 37, 38, 39) It also has some anti-aging benefits, and isn’t photosensitizing! (40, 41, 42) Meaning it doesn’t increase sun sensitivity like other chemical exfoliates (e.g. AHAs and Retinoids). Sooooo… basically the addition of Salicylic Acid in InstaNatural’s Vitamin C Serum is deceptive and nothing more than marketing hype. A fantastic oil for dry skin that sinks in quickly and has anti-inflammatory properties. (44) Contains linoleic, linolenic, oleic, and palmitic fatty acids. It’s rumored to have anti-aging benefits and treat hyperpigmentation because it has naturally occurring vitamin A (tretinoin). (45, 46) There’s also some evidence that rosehip oil is good for acne. Contrary to popular belief, the addition of essential oils in moisturizers and serums are generally a bad thing. Most of them are simply too irritating to be left on skin. Depending on how sensitive you are, they may or may not pose a problem. The InstaNatural Vitamin C Serum 20% has both Lavender and Ylang Ylang Essential Oil. Both of which could be irritating. However, I remember it very well. It’s quite watery and thin, but definitely spreads easily and is non-drying. It dries very matte and is hardly noticeable on the skin. It smells strongly of citrus, but isn’t overwhelming. Overall, I enjoyed applying it and found no issues with it here. You may be wonder why I bought this serum twice if I find some of the ingredients questionable. Simple. Because it worked. I have no doubt that all the before and after pictures posted in the Amazon review section are real. The sheer number of how many there are speaks for itself. 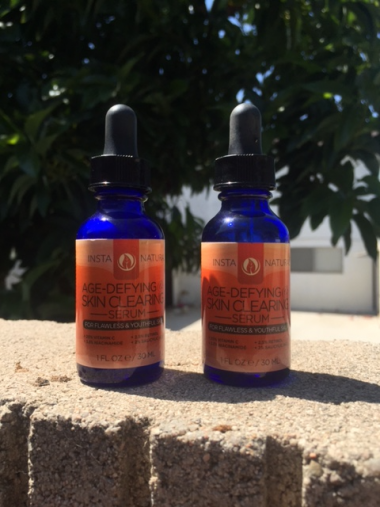 I saw very similar results every time I used this serum — brighter healthier looking skin and a reduction in hyperpigmentation. I’m positive it was because of the high 20% SAP content. The difference occured rather quickly and was noticeable within a couple of weeks. Like always, YMMV. The InstaNatural Vitamin C Serum 20% can be used twice daily (morning and night) without adverse side effects. Because SAP is pH dependent the placement of it in your routine is important. You want to apply it after cleanser and before moisturizer. If you’re incorporating low pH serums and exfoliates, those will come beforehand as well. Here’s an example routine with all things being considered. Adjust this accordingly to what you use personally as some of these steps won’t apply. There’s some great ingredients like Vitamin C (SAP), Niacinamide, tea tree oil, and rosehip seed oil. However the addition of Retinol and Salicylic Acid are questionable because the product isn’t properly formulated for these to work. Lavender and Ylang Ylang Essential Oil may be irritating for those with sensitive skin. Fights acne, lightens skin, treats hyperpigmentation, and provides photoprotective properties. But once again, could be irritating if you have sensitive skin. Has a lot of slip, spreads easily, dries matte, and leaves no tacky feeling. Smells very citrus-like. No real complaints here. The packaging is nice. And the dropper dispenser is fine because we don’t have to worry about the ingredients oxidizing quickly. Very decently priced for the amount of product and 20% Vitamin C (SAP) you receive. Not bad, but I think there are better SAP products out there like Mad Hippie’s Vitamin C Serum. In my opinion, this serum would rank way higher if the marketing wasn’t so deceptive and the essential oils removed. On the other hand, the high vitamin C content in this product undeniably produces results. If you were looking to buy this serum for the sole purpose of retinol or salicylic acid, I’d skip out on it and look elsewhere. However, if that doesn’t bother you and the main selling point was the high Vitamin C content (20%) then this is a good option. Hope you’ve enjoyed this review! Have a lovely day. Was your InstaNaturals serum orange? I was reading in some of the reviews that it is supposed to be clear and if it is orange, it is oxidized and no longer effective. What are your thoughts? Is vitamin c serum safe to use on sensitive skin? Is it best to use in the morning or evening? Also can I use this and my estee lauder advanced night repair? I have not purchased yet but trying to do my research. Thank you for your time. If I’m not mistaken, this product uses Capryloyl Salicylic Acid (or LHA), which is a modified form of salicylic acid that is more lipophilic and less acidic (and less irritating!). It should retain more function in a pH 7 solution than traditional Salicylic Acid. I’m using a similar product and it seems to be reducing my (self diagnosed) demodectic rosacea. I actually suspect that it is the Capryloyl Salicylic Acid (or LHA) that is killing the demodex mites. Just a theory….. This was a fantastic review, thank you. 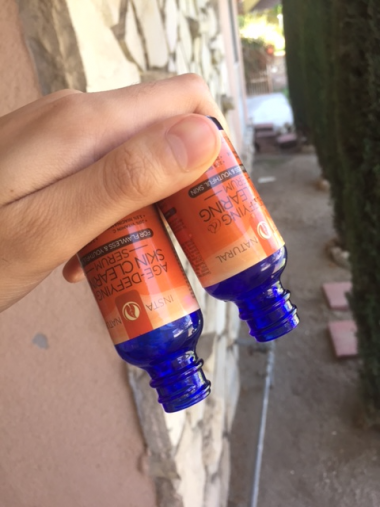 I recently started using an almost identical product (Truskin Naturals Tea Tree Clear Skin Serum). 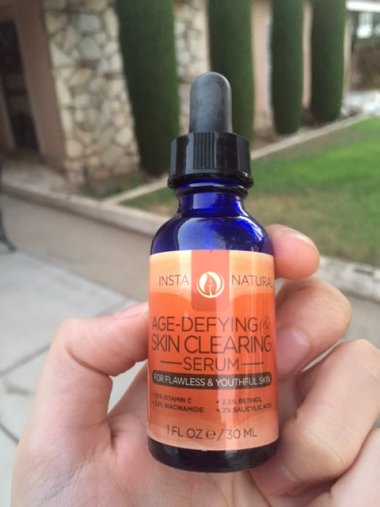 The ingredients (and percentages of ingredients) are essentially the same as the InstaNatural serum. When I first ordered it, I was going with the ‘more is better’ idea, and this formulation had great reviews, but after continuing to research, I didn’t understand how all the ingredients could actually be effective together even after accounting for the fact that the Vitamin C was in SAP form. This was a great rundown of all that. While using this serum, I’ve been hesitant to use any other BHA for my blackheads because I didn’t want to overdo the salicylic acid and make my skin angry. But if the salicylic acid in the vitamin C serum is essentially rendered neutral, do you think it would be okay/beneficial to add a standalone BHA product (I’m leaning toward the Cosrx BHA blackhead power liquid)? I also have a night moisturizer with retinol in it that I’ve stopped using since starting this serum for the same reason – I didn’t want to go overboard with the retinol. Would you continue to stay away from using the retinol-laced moisturizer, or do you think they are okay together? And last question (sorry for the long questions!) – do you think the serum is better used day or night? I’ve read vitamin C and niacinimide are beneficial during the day because they help sunscreen work better, but that retinol and salicylic acid are best for night because they make skin extra sensitive to the sun. So I’ve been going in circles on not only whether to apply it day or night, but also whether to apply or before or after toner and/or essence. Thanks in advance! Thank you for all the methodical work, it is right up my ally. I was wondering if you had heard of or checked out the Vitamin C concentrated serum from derma e.